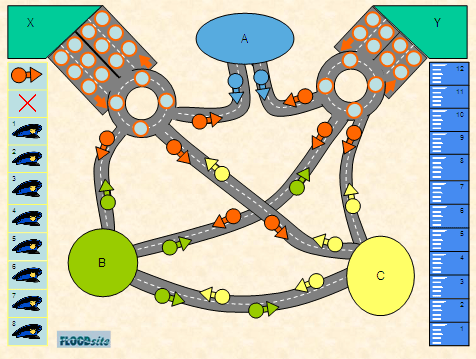 The evacuation board game provides a simplified picture of traffic management during an evacuation. If everyone leaves at the same time, the traffic will be jammed and only a few persons will be able to save themselves. Mayors and traffic managers have to try to get as many people as possible out of the area. All parts of the game can be downloaded and printed, except the pawns. You can buy loose pawns or other small playing pieces (backgammon pieces, mini roulette chips) in game shops. You can download the game here. You can download the board here.